A couple weeks ago, I attended a party on Dia de los Muertos. Over the past few years, I've been doing skull makeup at least once a year, for various things. I decided this was the perfect time to do a La Calavera Catrina, in honor of Dia de los Muertos. I wanted to play with a softer design and do colored eyes instead of my normal black. 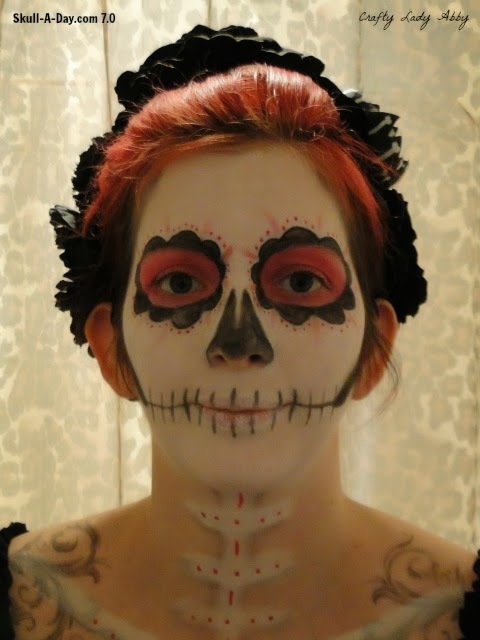 For this one, I also painted bones on my neck and decolletage. To learn how I created this look, follow this tutorial. After the tutorial, there are some photos from the party. This was taken after we got home from the party, so my lips are a little smudged, but everything else stayed well. Use these photos as a guide for detail placement. 1) I squeeze a little white creme makeup onto the back of my left hand (my right is predominate). I dipped the foundation brush into some of that white creme makeup. I used the brush to evenly coat my face (including my eye area and lips), adding more foundation to the brush as needed. I blended it around my hair line, jaw, and chin. 2) Using that same brush and more white creme makeup, I painted neck, and chest bones, following where they naturally occur and an anatomical bones diagram. 3) Using the powder puff, I applied an even layer of white face powder all over my face. I carefully applied the white powder on the chest bones too. 4) Using the NYX jumbo pencil in Milk, I filled in my lips better. I powdered them again for staying power. 5) Using the black eyeliner pencil, I drew an oval-like shape around my eyes, following my orbital bone, but higher on the under eye area. I've found that in the past, if I draw that section too low, I have odd panda eyes. I draw my line above the orbital bone under my eyes. 6) Using the small makeup brush, pat the red eyeshadow all over the eye area inside the circle. Make sure you met the color at the edge of the circle, top and bottom eyelids. Since I didn't use liner there, like I would for normal makeup, it's important to fill in the eye area completely with red. 7) Using the black eyeliner pencil, draw petal shapes around the red eye areas. Keep each petal as even as possible, and follow the curves of your face. Both eyes should match as close as possible. I did largeish petals, but you could do smaller ones if you want to. 8) Using the smaller precision makeup brush, carefully fill in the petals with the black eyeshadow. 9) With the same brush and eyeshadow, I drew and filled in the nose. I left a sliver of white along the nose, to represent the vertical bone inside the nose cavity. 10) I sucked in my cheeks to I could locate the hollows of my cheeks. Using the black eyeliner pencil, I drew the hollows of my cheeks, following the natural shape on my face. Using that same brush and black eyeshadow, I filled in that hollow. 11) Using the blending brush and grey eyeshadow, I shaded my temples and softly up around my hairline. I lightly shaded above the cheek hollow line. I shaded the chest and neck bones too. 12) I cleaned off the smallest brush. I used that brush and the red eyeshadow, to draw lines radiating from between the petals around my eyes. 13) Using the red liquid eyeliner, I added dots between those lines, following the petal shape. I also placed dots and lines down the neck and chest bones. 14) Using the black eyeliner pencil, draw lines from the corner of your mouth to the cheek hollow areas, angling up a bit. 15) Using the black eyeliner pencil, draw lines for teeth. These don't need to be anatomically correct, but the should be symmetrical. This is how I did my look. You can amp up this look with sparkle. Use eyelash glue and small flat back gems. Too Faced Shadow Insurance Glitter Glue and cosmetic grade glitters are the perfect combo to add long last glitter to your face. You can deepen the black and red by using a sticky colored base like NYX's Jumbo Eye Pencils, before applying the eyeshadows. My design is simplified, but you could add more details to the forehead, cheeks, jaw, and chin if you want to. 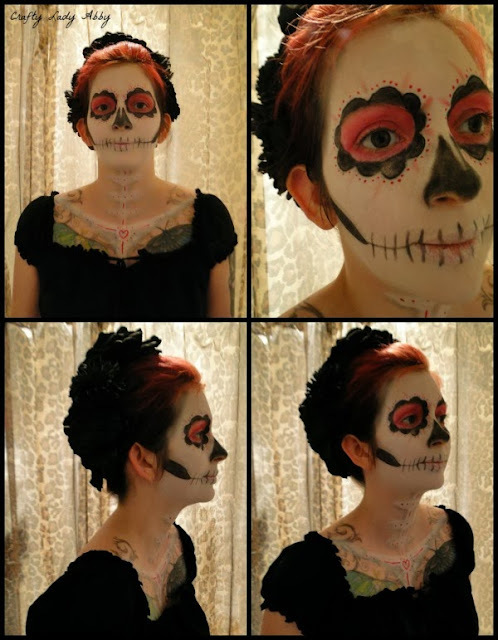 There are thousands of Dia de los Muertos looks out there to use for inspiration. However you do your makeup, find a way to make the design your own interpretation. These are photos from the party, that friends, Alex, and I took. The weather was warm, and the sun was bright. Glad I brought my sunglasses! For my outfit, I wore a long black dress, a red wide belt, flats, and a striped long cardigan. I split my hair into two low braids. I used bobby pins to secure them on top of my head. Using many black hair flower clips that I had made, I made a flower crown by clipping the flowers onto my hair, following the ring of braids and across the back. You can see tutorials on doing this type of hair style, here. As you can see, my daughter is wearing skull makeup too. 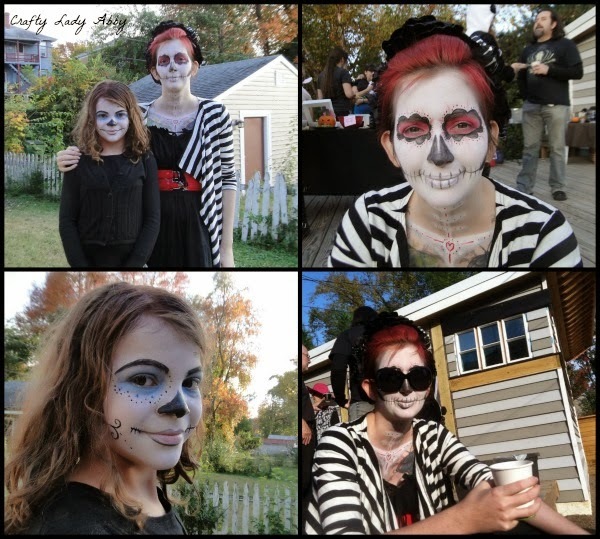 We watched this Skelita Calaveras makeup tutorial to turn Alex into the Monster High character. Alex did the white and part of the blue herself. I did the rest of her makeup. Alex had on skeleton tights, boots, a colorful painterly skirt, black t-shirt, and black cardigan. That is all for this tutorial and outfit. I hope your Dia de los Muertos celebrations were full of stories of ancestors, and time spent with friends and family.